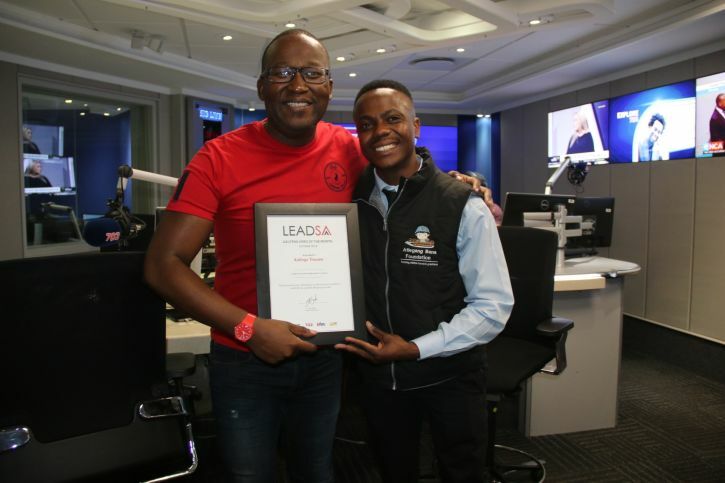 Teacher and social entrepreneur Katlego Thwane, from Dobsonville in the South of Johannesburg, was recognised as the LeadSA hero for October. Katlego founded Atlegang Bana Foundation to assist academically challenged and underprivileged children in Soweto. He offers them extra classes on weekends and provides an environment where the curiosity of children can thrive. He also provides the children with lunch at his Saturday classes, as most of these children are from under privileged homes. Studying towards a degree in intermediate and senior phase education, Katlego says his decision to help arose when he realized that some of the pupils in his school were struggling to read and write. He started by moving his furniture out on weekends to transform his bedroom into a learning area and focused on imparting his skills. I am so proud of Katlego for this well-deserved selection as a LeadSA Hero! I am even more proud of Katlego for the incredible work he does both as a teacher and through Atlegang Bana Foundation. For years he has given his time and more to serve the children. And simultaneously continued to work and grow as a teacher at Nova Pioneer, always showing up with joy and care for his students. From humble beginnings Atlegang Bana has grown to serve more students with an enriched programme. In his progression, Katlego was also recognised as the 2017 Soweto Social Entrepreneur of the year, which has given a big boost to the efforts of his foundation. Thank you to LeadSA for recognising Katlego's efforts through this award. He is indeed a hero! Katlego unpacked more about Atlegang Bana Foundation on 702’s Breakfast show with Bongani Bingwa.